Until now, there is one thing for sure: water used to flow on the surface of Mars many many years ago; to support this fact, there is plenty of evidence, such as riverbeds, canyons and minerals soaked with water. However, one thing remains unknown: the reason why Mars dried up. The theory that has won the most points so far suggest that most of the planet’s atmosphere was stripped by the solar wind not long after the planet lost its global magnetic field, roughly 4 billion years ago. As a consequence, the air became so wispy that Mars couldn’t support running water on its surface anymore. 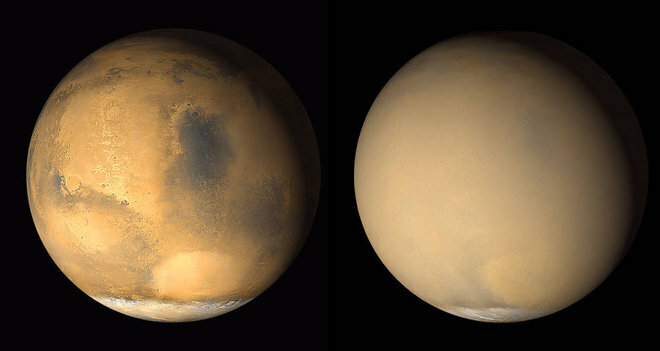 Researchers reanalyzed dust-storm observations made by NASA’s Mars Reconnaissance Orbiter and saw water vapor increase in the middle atmosphere, 30 to 60 miles up, during regional dust storms. However, water vapor was most affected during a dust storm in 2007, as it moved to a higher altitude and increased in volume more than a hundredfold. Other observations suggest that there is a link between the planet’s middle atmosphere water volume and the escape of atmospheric hydrogen into space.